For about the last 25 years, the proper term for a wolf and domestic dog mix has been commonly accepted as ‘wolfdog’. Since the dogs and wolves are of the same species, the term hybrid is technically incorrect, although it is still commonly used. Being that the wolfdog or wolf hybrid, as many call it, is a cross between a wolf and a domestic dog, this breed cannot be considered as purebred. Many like to stress that they are just mutts. It is really impossible to know exactly what kind of temperament you will get in any given wolfdog. As in any breed, disposition and temperament will vary at least slightly by dog and ancestry plays a big role. When looking at a wolfdog pup, the only true way to best determine what the pups temperament might be like is to research all breeds that were used in the cross. Understand that the pup you choose can end up with any combination of the characteristics found in any of the breeds that were used. For example, many wolfdog owners will tell you, this mix seems to have an affinity for rolling in and on any foul smelling thing they can find. It would seem that the more offensive the smell is, the happier they are to coat themselves in the stench. The wolf characteristics in a wolfdog hybrid do not generally begin to emerge until the pup is around 18 months of age. Up until this point, the pup, by all observations, acts just like a regular domestic dog. They are easy to direct, and they adapt well and love to play. They also bond easily, not only with humans, but also with other species. As the post adolescent stage approaches, the hormonal system begins to change with the onset of maturity and behaviors that are more typical to the wolf breed will become more apparent. Many believe that the wild instinct inherently found in the wolf part of a hybrid are always stronger than whatever other breed it was mixed with. This would make any wolf mix a difficult dog to handle and even dangerous to have around children. Others believe that with the right breeding and the proper training and socialization, a wolfdog can be domesticated and adapted to any lifestyle alongside human and can even serve in the role of a beloved family pet. The reality of it is, that every wolfdog will react differently towards humans and training. 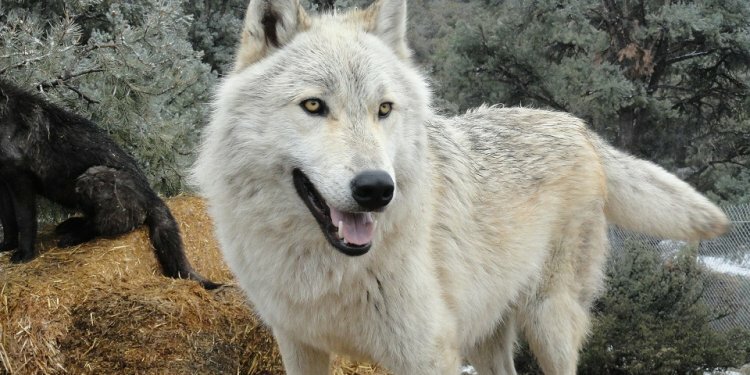 Some wolfdogs will seem to take on more of the characteristics of their domestic ancestors. These will be loving, outgoing, more naturally obedient, content to live indoors and follow their Alpha’s guidance.